County Flags Day is a celebration of the nation’s historic counties through the flying of flags. 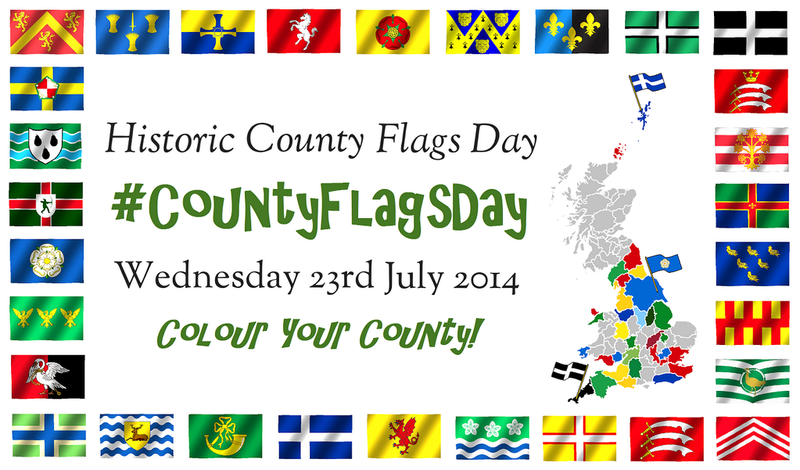 The inaugural “County Flags Day” was Wednesday, 23rd July, 2014. This date was chosen because it is the anniversary of the creation of the flag of Devon in 2002, which started the momentum of the modern concept of a county flag. An initiative of the Association of British Counties the concept is endorsed by the Flag Instituteand the Department for Communities & Local Government. The aim of Historic County Flags Day is to have as many county flags flying across Great Britain as possible on one day, 23rd July, to mark the nation’s historic counties. “In Great Britain, our most enduring tribal groupings are perhaps our traditional counties. Rich in history, yet inclusive of all of parts of society, these areas have survived modern administrative boundary changes and – due in no small part to the efforts of the Association of British Counties – are enjoying an impressive resurgence. The historic counties speak to us of the wonderful diversity of the UK, each possessing its own distinctive history, landscapes, traditions, dialects and building styles. Their long unbroken histories have made them the natural basis for cultural, social and sporting organisations. This common inheritance is something which we should value and cherish. Displaying your county’s flag on 23rd July (and every other day too!) is a perfect way to do this. You are invited to participate in this celebration. This entry was posted in County Flag Day. Bookmark the permalink.